Purrazzo hit a gourdbuster into an armbar for the submission win. Sakai tried to shake her hand after the match, but Purrazzo declined to a chorus of boos. - Bobby Cruise came out to start the main portion of the show with a lot of people still in line for the Kenny Omega meet and greet. Cruise said that they're taping the show for VOD. Titus hit a superkick and they followed it up with a top rope suplex/splash combo to get the win. The crowd went crazy for Page when the Bullet Club's music hit. He tried to Too Sweet the crowd, but shook his head before their fingers touched. The crowd started a big "One Sweet" chant. KUSHIDA won with the Hoverboard Lock after holding onto the submission when he hit a superplex. Kazarian got a mixed reaction, but Lethal got maybe the biggest non-Bullet Club pop of the night. They had an excellent match with a lot of near falls. Lethal won with the Lethal Injection and the crowd popped huge for the finish. Silas Young came out to a nice reaction before the match. He cut a promo hyping his match with Suzuki in Pittsburgh tomorrow, drawing "What about us?" chants from the crowd. Young said that he was going to do commentary with Ian Riccaboni and Colt Cabana. War Machine were pretty over and Briscoe got "Man up" chants. KES didn't get much of a reaction and Suzuki only got a respectful pop, but there were eventually chants for Suzuki-gun and the crowd got more into him. These guys beat the snot out of each other immediately. Eventually, Suzuki got a choke on Briscoe into a delayed Gotch-style piledriver for the win. Silas Young demanded for Suzuki to notice him while they were celebrating, but Suzuki completely ignored him. The crowd thanked War Machine and Briscoe as they stood in the ring and bowed after their loss. - Unannounced, Bully Ray walked out and the crowd lost their minds. He got huge "ECW" chants and a huge pop. Bully Ray was tearing up, then said he was injured at Death Before Dishonor last month and doesn't know what the future holds, but he hasn't been feeling good. The crowd chanted that they love Bully and thanked him as he choked up in tears again. Bully said this is the first time he's been at a loss for words. He mentioned ECW and said something about ROH doing what they did 20 years ago. He said he loves Buffalo, and if nothing else he just wants to thank the city for all they’ve meant for him. He got on his knees and said thank you and started to tear up again. If this is an angle, this alone was worth running in Buffalo. The crowd just ate everything up. Neither got much of a reaction as the crowd was burnt out after the Bully Ray segment. The crowd picked up a bit as the match went on, with Leon winning with a modified pumphandle driver. She hugged Rose after the match and raised her arm. There were "Daryl" chants (for Takahashi's stuffed cat) and a lot of people had their own Daryls. There was even a "Daryl's gonna kill you" chant. Daniels tried to shush the crowd, leading to massive chants for Takahashi. Daniels stalled for a bit before the match got going. Daniels mocked the "Adam Cole Bay-Bay!" pose to boos during the match. Daniels grabbed Daryl and started biting him, which the crowd was horrified by. He used Daryl to hit Takahashi, but Takahashi hulked up from it. Daniels kissed Daryl and tried to roll-up Takahashi, with Takahashi countering with a hurricanrana into a triangle for the submission win. Referee Todd Sinclair raised Daryl's paw after the match. The crowd started chanting "Shake his paw" before Daniels and Takahashi embraced, but Daryl struck Daniels to get his revenge. Daniels then stumbled out and tried to attack one of the Daryls in the crowd before being restrained by security. Yano seemed surprised by how over he was, but his pop was nothing compared to what his opponents got. Cody received the biggest pop of the night so far aside from Bully Ray. The crowd wanted to see Cody and Yano start, and they obliged. They forced Yano to kiss Cody's ring, then Yano went for a low blow as the match started. Seeing Yano live was more fun than I thought it would be. He finally got the turnbuckle off, but the referee stopped him from using it. While that happened, Cody hit a low blow and the Cross Rhodes for the win. This was the sleeper match of the night. They made it work with the size difference, and there were too many excellent spots to mention. Martinez eventually got the win with his finisher. There was a huge "That was awesome" chant after the match, with Martinez yelling damn right it was as he left. Chants for The Elite started as soon as everyone knew it was time for the main event, with them making us wait and building the anticipation. The venue was shaking as the crowd did the Terminator claps. 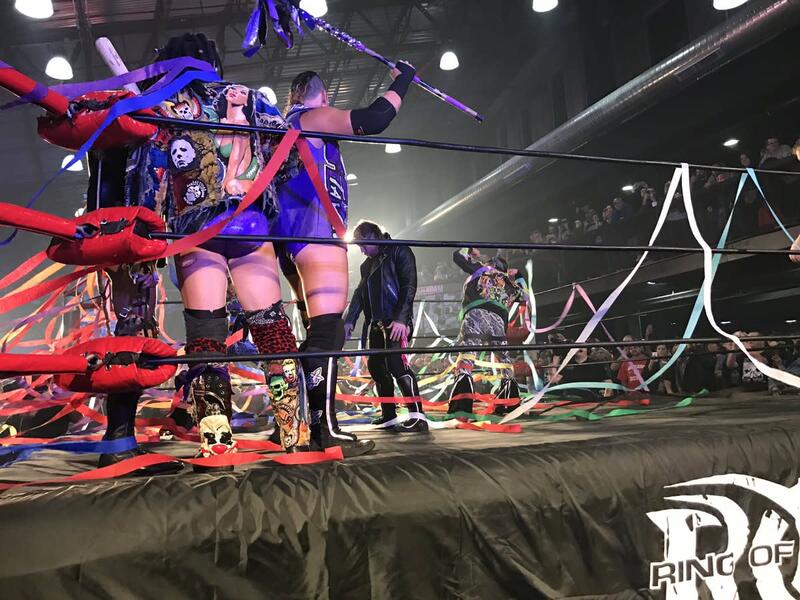 The Kingdom's music hit first to collective groans, but their music was abruptly cut and The Young Bucks' music started. The crowd erupted for that. The pop for Omega was unreal. There were "One Sweet" chants again as the Bucks got on the mic. They said they've modernized the Freedbird rule, and the ROH Six-Man Tag Team titles will be on the line here with Omega stepping in for Hangman Page. Matt Taven is perfect as a heel. Omega wanted to shake his hand, but Taven wanted a Too Sweet. That resulted in a "You can't do that" chant. Page, Scurll, and Cody came out at one point before the referee kicked the rest of the Bullet Club out and we were left with it being three-on-three. There were lots of unique and creative spots in the match. The Bucks got a "cease, cease, desist" chant going to the tune of their Elite chants at one point and the crowd was totally into it. Cody came back out to make the save, then the finish was The Elite doing a One Winged Angel into a Meltzer Driver for the win. That was a great and chaotic match. After it was over, all of the "Being the Elite" crew celebrated the victory as Omega grabbed the mic. A "Jimmy Jacobs" chant started and The Elite said what's up to him. Omega talked about how shocked he was at the reception he got tonight. He said he was only suppose to work the Global Wars tour show in Chicago, but supply and demand takes precedence and he goes where he's needed and wanted. Matt Jackson took the mic and mentioned the Bullet Club "invasion" of Raw to a huge pop. He talked about having the freedom to do what he wants and said he won’t get fired for taking a selfie with a friend or fan. Matt mentioned how we help feed their families before Nick interrupted to say that they'll see their families on Christmas, referencing WWE having Raw live on Christmas this year. That drew a huge "F*ck Vince" chant. Matt said Vince McMahon takes fun away from fans and told the fans to tell Vince what we think -- with the entire audience giving a Too Sweet. Omega quoted the movie "Braveheart" about never taking away their freedom, then he said goodbye and goodnight to the audience. The Bullet Club's music played and they jumped into the crowd to end the show.